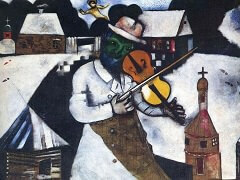 This small sketch in oil on cardboard was painted in Moscow, where Chagall went to live in May 1920. 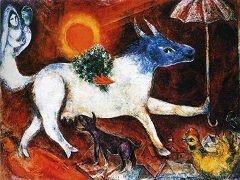 Despite its unassuming appearance, it does acquaint us with a new field of activity for Chagall and with some new and somewhat surprising pictorial ideas. As flat as a poster design, it shows a simple balancing act made up of geometrical elements: two circles, of light and of dark blue, rest one above the other and are poised on a white beam which seems to be rocking on the fulcrum of a white square. A slanting, slightly curved green plane indicates a pendulum movement. Built into this seesaw game is the marionette-like figure of a young man in a violet visored cap, who seems to support himself on the balancing beam, and whose whip shows him to be a circus trainer. His own attributes are only a tiny bird and a cheerful goat with a little bell around its neck - a constantly recurring Chagallian emblem for animal joyousness. 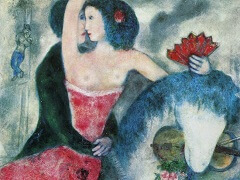 Without a doubt this little scenic design had something to do with the stage or cabaret, for Chagall was very much involved with the theater at that time. In 1919 in Petrograd he had, on his own, worked on the sets for two of Gogol's plays, having been stimulated by various contacts with theatrical people. 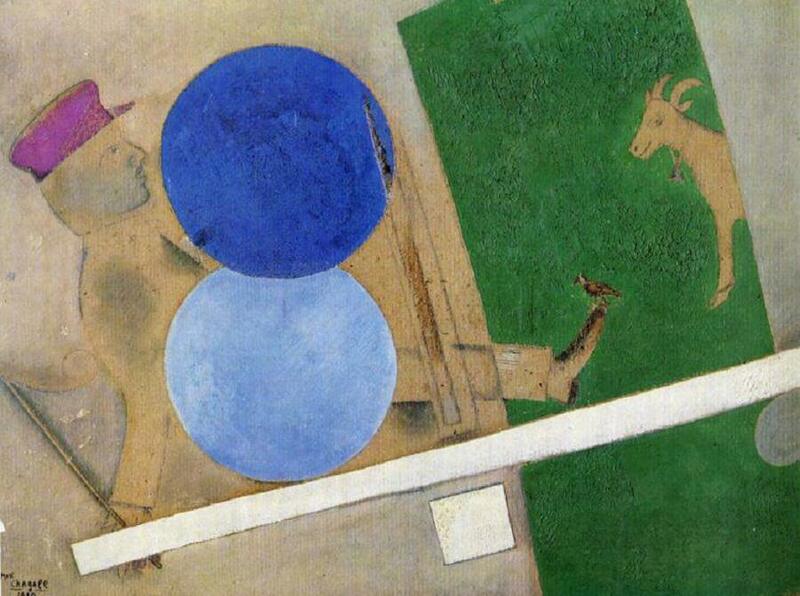 In 1920 in Moscow he was occupied with designs for Gogol's The Inspector General, which include many geometrical, Suprematist formal elements. In the end, none of these numerous and still existing designs was put into execution, however. 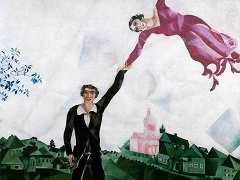 Only once, in the Jewish Theater in Moscow, was Chagall able to become really active for the stage, doing the sets for three small plays by Sholem Aleichem. From then on, his enthusiasm for the theater never waned. 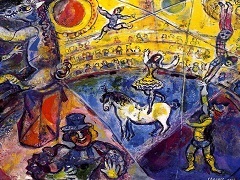 Despite the incidental character of the picture here it makes us aware of fundamental trends in Chagall's perception of the theater. It shows that he envisaged the theater as a thoroughly artificial counterworld, void of any naturalism, where the action is set in motion by forms and figures, and where variety turns and clowning also have a part. He looked on the actor in a similar way - as indicated by this painting - more as a figure and marionette than as the performer of an anecdotal or psychological role. 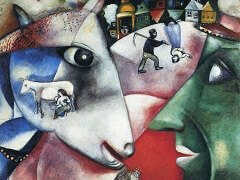 Whoever writes the history of the modern theater ought not to overlook these early suggestions of Chagall's.